With all of the new mountain bike trails opening in Northeast Ohio, most recently the East Rim Trail in the Cuyahoga Valley National Park, and the Hampton Hills Mountain Bike Trails in Summit Metro Parks, it's been easy to overlook a forgotten little gem in the local mountain biking scene. 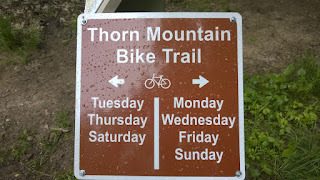 The Thorn Mountain Bike Trail at Findley State Park is a 9-mile loop with challenges for both novices and experts. It has mostly level terrain through heavily wooded areas with steep short climbs, fast winding sections, bank turns, and north-shore-style obstacles (novice riders can by-pass these areas). The trail can be accessed from many locations throughout the park; the official start is at the north end of the park at the dam parking lot. The local volunteers that help maintain the Thorn Trail have not been sitting back. They've been trimming the spring weeds and doing other work on the trail surface. 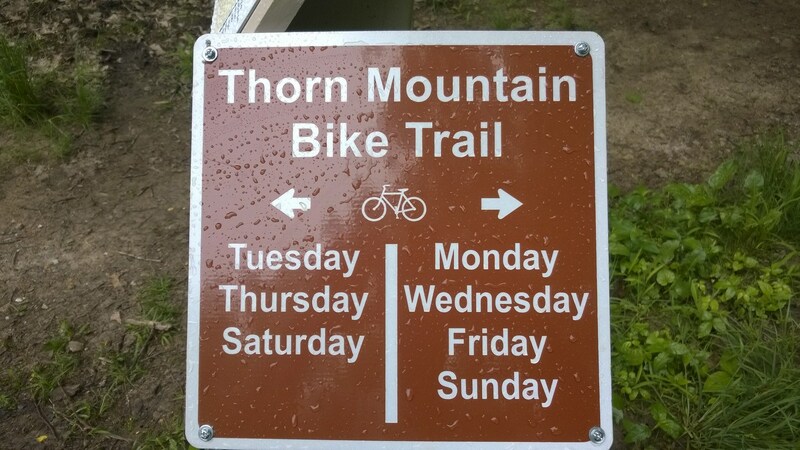 The Thorn Mountain Bike Trail is now directional based on the day of the week. Signs are posted at the MTB trail head, long/short split, road crossing by the chapel, access lane across from park office, and where the trail crosses the picnic shelter parking lot. They are in the process of placing directional signs on the mile marker posts as well. Mileage signs will be updated to be readable from both directions. Findley State Park is located at 25381 State Route 58 near Wellington, Ohio, in nearby Lorain County.